If you have recently come to live in Whitchurch or Whitchurch Hill, our two churches at St. Mary's and St. John's extend to you a warm welcome! We hope that you will settle in well, enjoy walks in our lovely countryside, visit our three welcoming pubs, the Greyhound and Ferry Boat in Whitchurch and the Sun Inn up the hill in Hill Bottom, and make new friends. If you require further help and information please give either of the churchwardens a phone call (contact details below). We both work during the day so evenings are better if you would like to speak to us, or you can leave a message on our answerphones and we will get back to you - and we are always happy to come and visit you. You can check out the parish of Whitchurch which is part of the Langtree Team ministry. Our team is comprised of a family of villages that combines the resources of Checkendon, Woodcote, Stoke Row, Ipsden and North Stoke as well as the two churches in Whitchurch parish. In 2010 we saw the arrival of The Reverend Claire Alcock as our priest who, with her family of Chris her husband, Tom, Eve and Kit, lives in St Mary's House. Claire brings many talents and gifts as well as being musical, and is reading for a master's degree in theology which keeps her busy. As well as the regular communion services at out churches we have Evening Prayer at St Mary's on the 2nd and 4th Sunday at 6pm. There is also a Family Communion at 11am on the 2nd Sunday of the month and an All Age Worship at 11am on the 4th Sunday, both at St John's, where young children and parents have lots of fun and where we encourage children to join in, so do not worry if your children like to let off steam. And there is coffee, squash and biscuits afterwards! There are lots of activities in the village and information on many of them can be found on this website and also in "The Bulletin", issued every three months to residents in Whitchurch-on-Thames. Its front and back covers list useful contact telephone numbers for parish, county and district councils, the medical practice, Whitchurch Primary School and various local associations. We also have a parish magazine, delivered every three months to every household in the parish. We are part of the Diocese of Oxford. Bishop John Pritchard, who has recently retired, has written the beautiful Intercession handbooks with creative ideas for public and private prayer, and he championed "Living Faith" which helped us think about our mission and ministry, both in our local and wider communities. Bishop Colin Fletcher is the Area Bishop of Dorchester who helps administer the Diocese in our area. Coffee in the Old Stables meeting room between 10:30 am and 12 noon on a Tuesday morning during term time for anyone - pensioners, parents, toddlers,carers - to drop in for coffee, tea, etc. There is an area for toys and nappy changing facilities. Supporting mission activities locally and in the third world. Old Stables Church meeting room holds up to 40 persons and has a kitchen and wash room. These facilities for benefit of the community and can be used for meetings, children's parties, etc. for a small donation. Support from Whitchurch people is essential for our future and well-being. 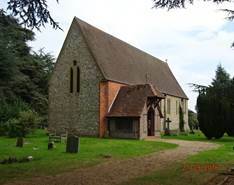 We would welcome all comers to our services but also hope that you can find time to appreciate the two buildings and their peaceful surroundings. Our vision statement: we seek to be a worshipping family, looking outwards to bless our community with the love of Christ. To find the days, times and locations of our services, see the Schedule of Services.